Although there is scholarly disagreement about where chess originated - India, the Persian empire, and China are contenders - it is certain that the game spread along the Great Silk Road. Indeed, the earliest, recognisable chess pieces, dated to 762 AD, have been excavated at Afrosiabs, capital of the former Sogdian empire, which stood north of present-day Samarkand. 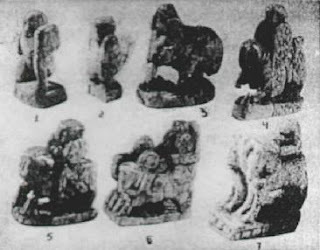 Archaeologist Yuri Buryakov's 1977 discovery of seven ivory chess pieces at Afrosiab was sensational at the time. They are heavily worn, but they include two foot soldiers with shields and short swords (pawns); a war elephant with chain armour and a rider in full battle-dress (bishop); a visier (queen) with two horses with armed rider; two mounted riders with sword and shield (knights); and the Shah, on a three-horse chariot, holding a mace-like symbol of power (king). Caravanserais provided an ideal setting for merchants to play, and wager on, chess. 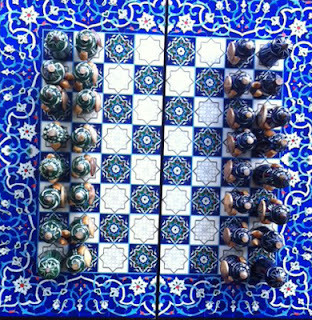 Sipping tea, discussing goods, exchanging news, and playing chess were all part of a stay at a caravanserai. 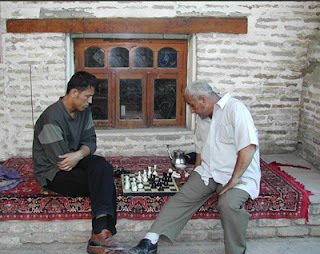 Uzbeks today are still passionate about chess. In chaikhanas (tea houses) you often see people whiling away some hours playing chess. Merchants outside their shops will roll out a carpet and play while waiting for business. If you are invited to play a game do grab the opportunity: it's a marvellous way to meet Uzbeks and no language skills are needed. There is significant government support to encourage girls and boys to excel at chess. Players do well in international competitions and Rustam Kasimdzhanov is Uzbekistan's best known Grand Master: aged 25 he won the 2004 FIDE World Chess Championship. On an Uzbek Journeys tour you visit the Afrosiabs site and museum. Samarkand is also the place to pick up exquisite, wooden chess sets: the designs of the boards are based on the patterns of the tiles. And if you enjoy chess, consider including a portable set in your luggage: you will make many new friends.